What are the 3 natural anti-coagulant system? What are the 4 pharmacological anticoagulation mechanism? 1. Protein C Anti-couagulant system. APC leads to degradation of Factor Va, and VIIIa. What are the defects associated with defects in Protein C Anti-coagulant system? APC also inhibits inhibitor of tPA (tissue plasminogen activator), thus activating plasminogen to plasmin conversion. Plasmin causes fibrinolysis. What are the components of this system? Synthesized in endothelial cells and stored in platelets and in plasma. TFPI forms complex with Xa. TFPI/Xa complex then inhibits TF/VIIa. Thus, it shuts down extrinsic pathway. Blocks vitamin K dependent post translational modification of Protein C,S, Factor II, VII, IX, X.
LMWH and Fondaparinux are an Indirect Xa inhibitor acting via Anti-thrombin. Parenteral agent: Argatroban, Lepirudin, Bivalirudin (Angiomax). Binds with high affinity, and specificity with thrombin's active site, thus inhibiting the fibrinogen to fibrin formation. Does warfarin help in cancer associated thrombosis? Probably it does not help. Phelgmesia or gangrene may happen soon after the over lap of heparin - warfarin is over. While heparin is used, it activates thrombin - antithrombin complex (T-AT Complex) inhibiting the thrombin generation. So, platelet count is also high. Soon after heparin bridge is over, T-AT Complex does not work any more leading to more clot formation. 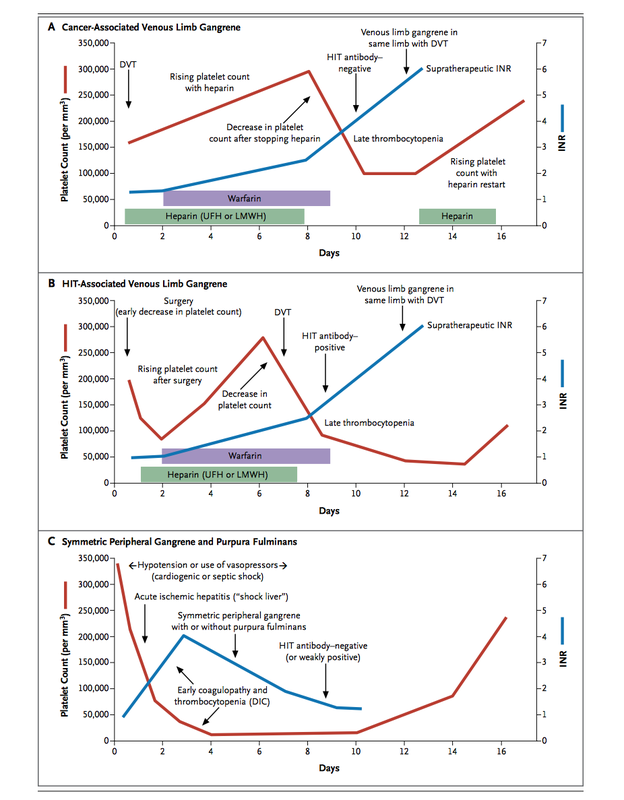 This is reflected by decreasing platelet count after heparin is stopped. Coumadin has no role in this pathophysiology. Rather Coumadin makes it worse! Warfarin use causes severe protein C deficiency. This promotes micro thrombosis. This is reflected by supra therapeutic INR. Mechanism of gangrene in HIT? 2. Venous limb gangrene associated with protein C deficiency either due to warfarin use or DIC. Note: DIC causes loss of both protein C and anti-thromobin. 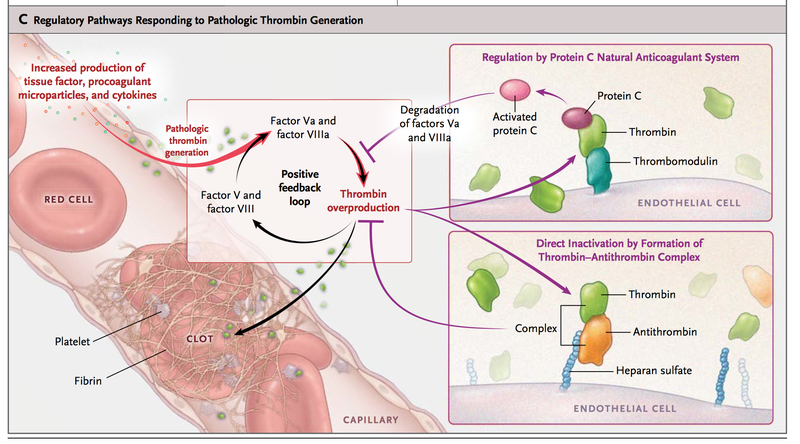 Also, since there are other coagulant factor (i.e Factor II (prothrombin), Factor, IX, Factor X) in relative excess, thrombin generation persists despite supra therapeutic INR, and micro thrombosis continues. How to differentiate HIT associated gangrene from Cancer associated gangrene? In HIT, you have to stop Heparin to prevent further clot formation. In Cancer associated gangrene, you have to use Heparin to prevent clot formation. Warfarin Induced Venous Limb Gangrene. What is the difference between these two conditions? Both conditions are due to severe depletion of protein C.
Skin Necrosis occurs in patient with defective Protein C Anti-coagulant system (Protein C deficiency or Factor V leiden). Shock: Decreased Protein C and Anti-thrombin shifts towards pro-coagulant state. Because of Decreased Protein C, INR is high. Yet, due to procoagulant state, consumptive process occurs. This leads to thrombocytopenia.